Abdi, R., Chalabianloo, G. (2015). Prediction of the perfectionism by proposed model for abnormal personality dimensions. International Journal of Behavioral Sciences, 9(3), 210-214. Reza Abdi; Gholamreza Chalabianloo. "Prediction of the perfectionism by proposed model for abnormal personality dimensions". 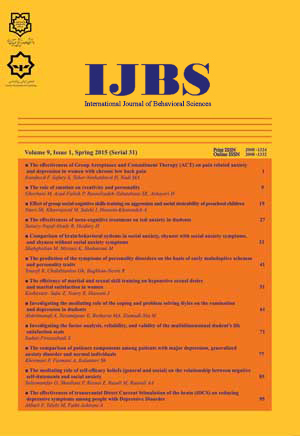 International Journal of Behavioral Sciences, 9, 3, 2015, 210-214. Abdi, R., Chalabianloo, G. (2015). 'Prediction of the perfectionism by proposed model for abnormal personality dimensions', International Journal of Behavioral Sciences, 9(3), pp. 210-214. Abdi, R., Chalabianloo, G. Prediction of the perfectionism by proposed model for abnormal personality dimensions. International Journal of Behavioral Sciences, 2015; 9(3): 210-214. Introduction: The aim of this study is to investigate the relationship between the dimensions of perfectionism and abnormal personality dimensions introduced in the fifth edition of Diagnostic and Statistical Manual of Mental Disorders, and to address this issue that to what extent each personality dimension can predict the dimensions of to perfectionism.Method: The present study is descriptive and correlational. The study took place on a sample of 270 individuals from the population of university students in Ramsar city. In the way that the participants were evaluated through two Tehran Multidimensional Perfectionism and PID-5 questionnaire. In this study, multiple regression was used to analyze data.Results: The results showed that in addition to the correlation among all abnormal personality Dimensions with the dimensions of perfectionism, negative effect can be a good predictor for self-oriented perfectionism and other oriented perfectionism; and also disinhibition was found as the best predictor for socially-prescribed perfectionism.Conclusion: Considering the importance of perfectionism and its role in many defects and psychiatric, physical, and social disorders; it is imperative that experts in research, prevention, and treatment take more efficient steps in leading this personality Dimensions towardbeing more adaptive and normal. Frost RO, Marten PA, Lahart C. Rosenblate R. The Dimension of Perfectionism. Cognitive Ther Res. 1990; 14: 449-78. Hewitt PL, Caelian CF, Flett GL, Sherry SB, Collins L, Flynn CA. Perfectionism in children: associations with depression, anxiety, and anger. Pers Indiv Diff. 2002; 32, 1049- 61. Hamachek DE. Psychodynamics of Normal and Neurotic Perfectionism Psychology. J Hum Behav. 1978; 15:27-33. Egan S, Piek JP, Dyck MJ, Rees CS. The Role of Dichotomous Thinking inPerfectionism. Adv Behav Res Ther. 2007; 45, 1831- 22. Krueger RF, Derringer J, Markon KE, Watson D, Skodol AE. Initial Construction of a Maladaptive Personality Trait Model and Inventory for Dsm-5. Psychol Med. 2012; 42: 1879-90. 7. Stump H, Parker W. A Hierarchical Structural Analysis of Perfectionism and Its Relation to Other Personality Characteristics. Pers Indiv Diff. 2000; 28: 837-52. Dunkley DM, Sanislow ChA, Grilo, CM, Mcglashan TH. Validity of Das Perfectionism and Need For Approval In Relation To the Five-Factor Model of Personality. Pers Indiv Diff. 2004; 37, 1391-400. Dunkley DM, Kyparissis A. What Is Das Self-Critical Perfectionism Really Measuring? Relations With The Five-Factor Model Of Personality And Depressive Symptoms. Pers Indiv Diff. 2008; 44, 1295â305. Dunkley DM, Blankstein KR, Zuroff DC, Lecce S, Hui D. Self-Critical and Personal Standards Factors of Perfectionism Located Within the Five-Factor Model of Personality. Pers Indiv Differ. 2006; 40, 409-20. Cruce SE, Pashak TJ, Handal PJ, Munz DC, Gfeller JD. Conscientious Perfectionism, Self-Evaluative Perfectionism, and the Five-Factor Model of Personality Traits. PERS INDIV DIFFER. 2012; 53, 268-73. Stoeber J, Hutchfield J, Wood KV. Perfectionism, Self-Efficacy, and Aspiration Level: Differential Effects of Perfectionistic Striving and Self-Criticism after Success and Failure. Pers Indiv Diff. 2008; 45; 323-7. Sherry SB, Hewitt PL, Flett GL, Lee-Baggley DL, Hall PA. Trait Perfectionism and Perfectionistic Self-Presentation in Personality Pathology. Pers Indiv Diff. 2007; 42: 477-90. Boisseau Ch L, Thompson-Brenner, H, Pratt EM, Farchione, TJ, Barlow DH. The Relationship between Decision-Making and Perfectionism in Obsessive-Compulsive Disorder and Eating Disorders. J Behav Ther Exp Psychol. 2013; 44, 316-21. 16. Sassaroli S, Romero Lauro LJ, Ruggiero G.M, Mauri MC, Vinai P, Frost R. Perfectionism in Depression, Obsessive-Compulsive Disorder and Eating Disorders. Adv Behav Res Ther. 2008; 46:757-65. Corry J, Green M, Roberts G, Frankland A, Wright A, Lau Ph, Loo C, Breakspear M, Mitchell Ph B. Anxiety, Stress and Perfectionism in Bipolar Disorder. J Affect Disorders. 2013; 151, 1016-24. Buhlmann U, Etcoff NL, Wilhelm S. Facial Attractiveness Ratings and Perfectionism in Body Dysmorphic Disorder and Obsessive-Compulsive Disorder. J Anxiety Disord. 2008; 22:540-7. Rasmussen SA, Eisen Jl. Clinical Features and Phenomenology of Obsessive Compulsive Disorder. Psychiatr Ann. 1989; 19: 67-73. Wright AG , Thomas KM, Hopwood CJ, Markon KE, Pincus AL, Krueger RF. The Hierarchical Structure of Dsm-5 Pathological Personality Traits. J Abnorm Psychol. 2012; 12: 951-7. American Psychiatric Association. Diagnostic and Statistical Manual of Mental Disorders; 2013. Flett GL, Hewitt PL, Blankstein KR, Koledin S. Dimensions of perfectionism and irrational thinking. J Rational-Emotive Cogn-Behav Ther. 1991; 9, 185-201. Ayearst LE, Flett GL, Hewitt PL. Where is multidimensional perfectionism in DSM-5? A question posed to the DSM-5 personality and personality disorders work group. Pers Disord: Theor ResTreat. 2012; 3: 458â69. Tritt ChM, Ryder AG, Ring AJ, Pincus AL. Pathological Narcissism and the Depressive Temperament. J Affect Disord. 2010; 122: 280- 4.
. Stoeber J. Multidimensional Perfectionism and the Dsm-5 Personality Traits. Pers Indiv Diff. 2014; 64: 115-20. Hill M, Hill D, Chabot AE, Barrall JF. A Survey of College Faculty and Student Procrastination. College Student Personnel J. 1978; 12: 256- 62.